First time home buyer advice to myself from my future Realtor self. 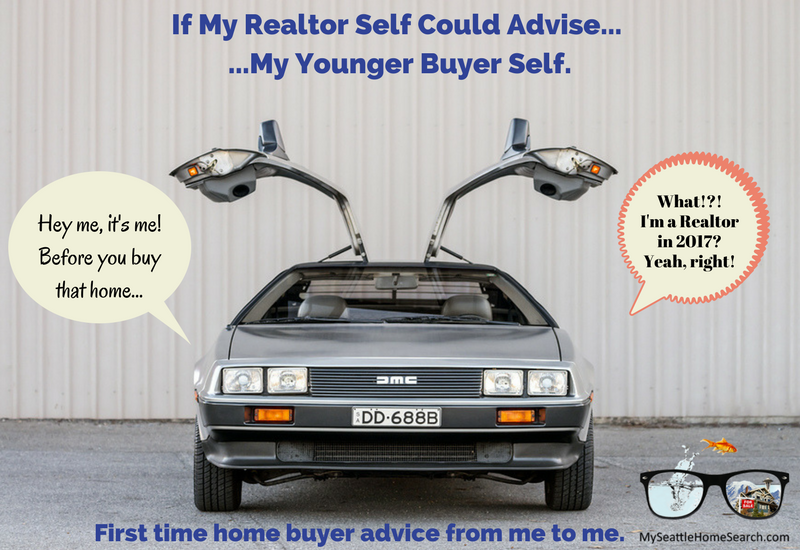 First time home buyer advice from me to me. If my calculations are correct, when this baby hits 88 miles per hour... you're gonna see some serious sh**! - Doc, Back To The Future. I bought my own home in 2003, 5 years before I became a Seattle Realtor. Was my home purchase flawless, perfect and stress-free? Absolutely not! Looking back, do I think that I could have done some things better? You betcha! I did some things well but could have done better on others. When you do something for a living, day in day out, things become second nature. Things seem, well…obvious. Having said that, as a Realtor you are always learning and always need to be learning. But compared to when I was a first time home buyer I’m now a veritable professor of all things real estate. When I look back with my current Realtor mindset at my home buying experience, there are definitely certain things that I could have done better. I love my home. It wasn’t perfect when I bought it, it’s not perfect now and probably never will be. I bought a 3 bedroom red brick Tudor home in the Ballard neighborhood in Seattle. It was dated and had been on the market for about 5 weeks even though it was a strong, and getting stronger, seller's market. The minute I walked in the front door it was a case of "THIS IS THE ONE! Where do I sign?"